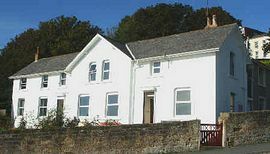 Three luxury cottages on the seafront at Filey. Two are three bedroomed and sleep 6 while the other is 2 bedroomed sleeping 4. The two three bedroomed properties have ensuite bathrooms off the master bedroom. These are perfect for a traditional beach holiday with easy access to the beach and town. The holiday cottages are in a prime position and both have living rooms at the front of the house overlooking Filey Bay with real flame gas fires for that cosy feel. Sitting in the garden at the front of the cottages looking out over the sea, drinking your morning coffee and taking in the panorama is definitely one of the holiday's most delightful pastimes. 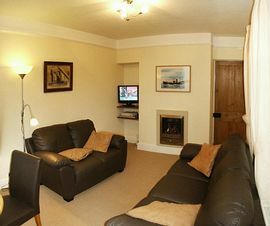 Living room at the front of the cottages with full sea views. Electric oven, electric ceramic hob and microwaves. Bed linen , towels and duvets included. Bench seat on Front terrace (superb for morning coffee). On the seafront next to the beach. Full sea views from all living rooms and the terrace. Front terrace with your own bench looking straight out to sea. Head straight down Filey main street towards the sea down Cargate Hill to the seafront where we are on the right hand side. Our website has up to date availability and prices with special offers. During the main holiday season lets are a full week Saturday to Saturday but at other times we can also offer 3 day lets.